Revitalizing the Employee Transport EcoSystem with FleetStar! Machines and buildings can be constructed, procured or leased for business. It is the employees that drive the growth of your business and are key to its sustenance. Most of the employees work in dynamic work time shifts, ambitious deadlines and multiple clients. Employees waste most of their time in waiting for their pick-ups or finding their cabs / buses during their office commute. During the mornings, no clue related to arrival of pick-ups leads to increase in anxiety and results in frequent calls to the bus drivers or transport managers. During late evenings, standing in queues or discovering the allocated cab and its location adds more to the woes of an employee traveling during late hours. Further, such instances also add up to inconvenient exchange of words & situations among employees, transport providers, transport managers and immediate bosses. Imagine your business with an employee who is free of any worries related to safety and hassles for their office commute. Imagine a system that can make your transport operations leaner, faster, efficient and smarter. Imagine the level of employee satisfaction that one of your female counterpart receives when she gets a confirmation call related to her safe drop at her place of stay. Imagine the confidence of an employee who is empowered with a sense of safety with assured help in emergency situations. Imagine FleetStar, an Employee Transport Management Solution with features that your employees would love to use! FleetStar, an initiative from eClerx Services Ltd, enables you with the trust of revitalizing your Employee Transport EcoSystem. Trust your employee transport operation automation with FleetStar that has served more than 5,000 users over half a decade at multiple locations with multiple working shifts. FleetStar’s award winning eTMS engine, dynamic routing algorithm, tested safety features, intelligent dashboards over the web and on mobile gives your employees the sense of traveling safe. What’s more? Since last 5 years, FleetStar has been evolved as a product since the traveling conditions, business requirements and employee expectations change. 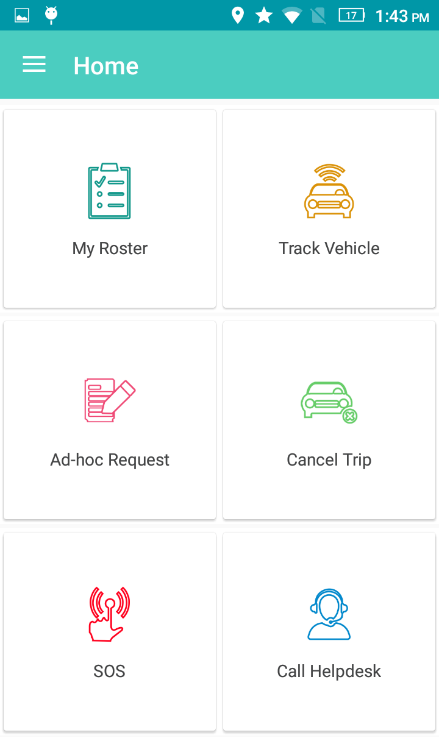 For optimum control and effective communication, in addition to web portal and mobile app for employees, we have introduced FleetStar’s mobile app for vehicles. FleetStar’s mobile app for Vehicles puts you in full control of the safety, location and operations of your allocated transport vehicles. This also eliminates the dependency on vehicle mounted GPS for location tracking and handles last minute changes in vehicle or driver allocation. Give your employees a hassle free office commute experience. Empower them with FleetStar!